Look: I know Kevin Love isn’t on the Wolves anymore. But I also know a bargain when I see it, and $2 for a nicely made jumpsuit (size 18 months) is a great deal. 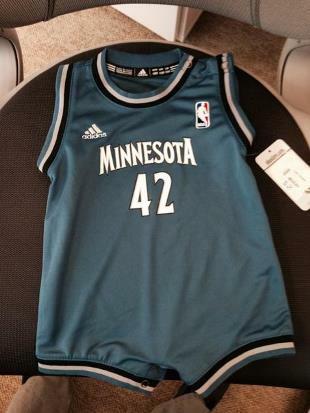 So I bought it for my daughter, Anabel, at the Wolves’ garage sale (and she almost certainly will be wearing it tonight during the Draft Lottery show). Many of the kitschy items were gone by the time I stopped this afternoon; those working the sale said there were 30 people waiting outside to get in when doors opened at 7 a.m., which is ridiculous and awesome all the same. But I’m not just here to talk about baby jumpsuits. No, my jumpsuit enthusiasm spills over here into multiple jumpsuits and this website where you can buy an adult NHL jumpsuit (they call it a onesie, but whatever). I don’t see the Wild listed as one of the teams, which is a shame. But that shouldn’t stop anyone from taking the plunge into jumpsuit ownership and the type of casual elegance it entails.